Twenty five years ago today, one man, who’s identity will likely never be known, demonstrated an act of courage in an attempt to stop the government of the Peoples republic of China from murdering it’s own unarmed people, humans who were simply seeking human rights that most people in America take for granted every day. His exact fate is unknown, but he very likely died for this gesture. It remains one of the single most moving acts on this planet in the 20th century. In those 100 years, time which saw the three worst dictators and many of lowest points in recorded history, this man, his identity “known but to God,” is remains a glimmer of hope that the goodness of man might reside in all of us and hopefully be awakened. The optimist in me believes that this man’s life was a triumph in history, he meant something by any measure as long as people understand that life is a gift from the universe, and not an allowance by the political state. But as a realist, I am forced to admit that we failed this man, because 25 years later, China is still a totalitarian police state without human rights, but as a nation we are A-OK with this as long as they fill up the shelves of Wall Mart and Home Depot with cheap consumer goods and they use the profits to finance our debt. There are 1.7 Billion people in China, and very few of them have ever heard of this man of Tiananmen Square, because they live in a country of censorship and total government control. For a long time there was a myth that if we just dealt with places like China, they would have to end up with more open societies. This joke was primary told to us by giant corporations who wanted access to cheap labor and new markets. Only the really naïve thought companies went to China for the betterment of the humans there. Sergey Brin, co-founder of Google, worth 30 billion dollars, was born in the USSR, a police state that denied human rights to his parents because of their faith. The came to the US as refugees. 20 years later, Brin cuts a deal on censorship with the Government of China for access to their country. He claimed it was in the best interest of the Chinese people. He made his cash for this deal with the devil, but eventually learned that they have stolen his companies secrets, including accessing identities of dissidents. read below and think about how one man escapes a police state and his son essentially hands over the names of human rights advocates for money. On this day, do not take your freedom to read about this man for granted, spend 15 minutes reading about a man who thought freedom of speech was worth dying for. If you need to understand that America is about the defense of human rights and not corporate profits and greed, get a good look at the man in the picture, he is Fang Zheng. Notice that he has no legs, because they were ground off by a T-59 tank tread in Tiananmen Square, perhaps the very same tank that the unknown hero tried to stop. Today, Zheng lives in the United Sates, and has been provided with prosthetic legs after spending 20 years in a Chinese wheel chair. 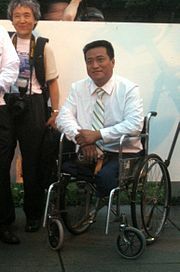 In 2008 his re-found ability to simply stand was a centerpiece of an event to bring awareness to human rights. If you walked today and could read any paper you wanted, perhaps you can spend 10 minutes reading toady about a man who had to fight for 20 years to have what most Americans take for granted: http://en.wikipedia.org/wiki/Fang_Zheng.